OJ RECORDS - was the manufacturing arm of Old Judge Music Publishing whose offices were locate at 1018 North Watkins Street in Memphis, Tennessee. The label seems to have begun operations sometime in 1956 or 1957 under the supervision of Bill Biggs and C. J. (Red) Matthews. While nothing is known of Biggs, Matthews was apparently involved in two other 1950’s recording enterprises, Holiday (of Memphis) and Ekko (of Hollywood, California). OJ Records was a small-time operation which tried to capture the public’s fancy by issuing singles in a number of musical fields, including rhythm and blues/black doo-wop (Chester Guyden, the Rockin’ Dukes), rockability/white rock and roll (Wailin’ Bill Dell, Charles Senns) and 50s teen pop (Wink Martindale, Bobby Chandler and the Stardusters, Nancy Lee, Dave Gardner). The label's first release on OJ 1000 was ''I'm Serious'' b/w ''If You Love’d Me'' by Bobby Chandler and the Stardusters, and judging by the number of copies which still turn up regularly in various record auctions, it was the company’s most successful venture. Though most of OJ’s artist have since vanished into obscurity, two names (Dave Gardner and Wink Martindale) went on to have noteworthy entertainment careers after the company folded around 1958. Born in Jackson, Tennessee, in 1926, Gardner began a musical career as a drummer and occasional vocalist. After a pair of demo singles for Decca Records around 1956, he waxed the pop tune "White Silver Sands'' which was successfully covered by crooner Don Rondo on the Jubilee label. Gardner’s other OJ efforts such as ''Fat Charlie'' and ''Mad Witch'', good though they were, failed to catch on with record-buyers of the day. It was his comedic routines between songs, however, that brought him to the attention of RCA Records producer Chet Atkins. Billed as Brother Dave Gardner, his comedy LP ''Rejoice, Dear Hearts''! displayed the rapid-fire wit and Southern dialect that propelled him into the limelight for a brief time in the early sixties. His popularity included several more albums and appearances on national television talk/variety shows such as ''The Tonight Show''. Though his star faded before his death in 1983, Gardner’s brand of topical humor still retains a cult following even to this day. Like Gardner, Wink Martindale also hailed from Jackson, Tennessee, where he was born in 1934. He started his career as a disc jockey at age 17 at WPLI in Jackson, earning $25 a week. While a student at Memphis State College, he hosted mornings at station WHBQ. It was around this time that Martindale cut his debut OJ single, ''Love’s Got Me Thinkin'' b/w ''Thought It Was Moonlove'' (1009). Though it fell flat sales-wise, it still had its good points: the topside displays a rockin’ beat and Martindale ride it to full effect, making up in enthusiasm what he may lack in vocal range. The teen ballad ''Moonlove'' is also well-chanted in a slightly countryish vein. It was at his tenure with WHBQ that Martindale became the host of the TV show ''Teenage Dance Party'' where his friend Elvis Presley made an appearance. Martindale’s rendition of the spoken-word song, ''Deck Of Cards'', earned him a 1959 appearance on Ed Sullivan’s network TV show and reputedly sold over a million copies. Since then, he has gone on to fame as a game show host on numerous programs, most famously ''Tic-Tac-Dough'' and ''Trivial Pursuit''. On June 2, 2006, Martindale received a star on the Hollywood Walk of Fame. 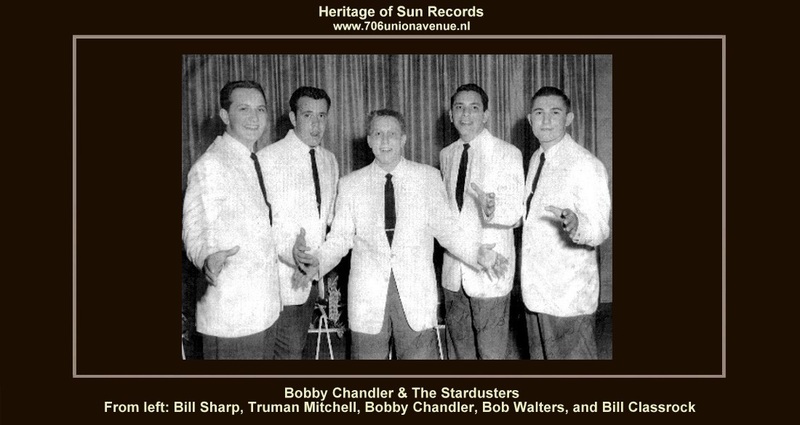 OJ Records’s most prolific artist was Bobby Chandler and the Stardusters. Like other white quartets of the period such as the Crescendos (Nasco) and Techniques (Roulette), the Stardusters used a melodic approach to ballad harmony and tried to cross-over into the white pop mainstream of the time. Their follow-up release ''Me And My Imagination'' (1005) received a full-page in the May 25, 1957 Cash Box issue, with the banner claim: ''Just Released, Already Breaking in Memphis, Baltimore, Chicago, Philadelphia, Miami and Spreading''. The group’s third and last OJ paring was ''Junior Prom'' b/w ''Winter Time'' (1012). It seems open to debate as to whether the Stardusters were also known as the Escorts (''Misty Eyes'' b/w ''Arrow Two Hearts'' on OJ 1010) or the group billed as the Bachelors who backed Nancy Lee on ''You’re My Inspiration'' b/w ''My Heart Has Wings'' (1004). Judging by her two issued sides, Lee’s vocal capabilities might have resulted in more sales had she been given stronger material to work with. Despite all the collector interest in rockabilly, doo-wop and teen pop, the OJ label remains a mysterious anomaly of the late 1950s. Only a small sampling of the label's total output has heretofore appeared on vinyl or CD reissues. This long-overdue compilation should be an intriguing package for anyone interested in these genres.